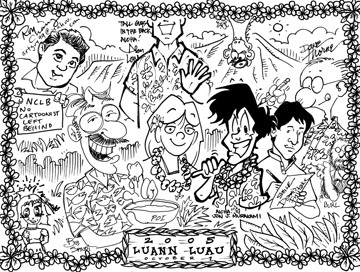 "Luann" cartoonist Greg Evans and his wife, Betty, were back in the islands recently, giving a series of talks and seminars and seeing the sights. The Evanses are fond of Hawaii, and the state pops up in "Luann" plots once in a while. At a farewell dinner for the Evanses, local cartoonists Alan Loh, Dave Thorne, Roy Chang, Jon J. Murakami, Bud Spindt, Dennis Fujitake and others passed around a blank sheet of paper and doodled up this "postcard." "Luann" runs on the Sunday Star-Bulletin comics pages. Stay with a marriage for 25 years and you're supposed to be rewarded with a gift of silver. 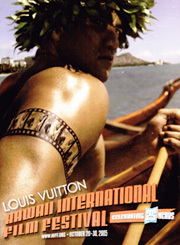 The Hawaii International Film Festival turns 25 this week, and its reward will be a packed line-up of very classy movies, and some serious starpower. Expected in town are directors Ang Lee and Zhang Yimou, actors Samuel L. Jackson and Bai Ling, and action icon Sonny Chiba. There's much more to be said, so turn to this page tomorrow for an overview. If you can't wait that long, visit www.hiff.org. Or call 528-4433. The festival starts Thursday and runs through Oct. 30. Eat like an Australian -- a very discriminating one -- this week as the Australian Trade Commission hosts a series of events designed to introduce local chefs and diners to such home-grown delicacies as barramundi and mullaway (fish), wattleseed and myrtle (flavorings), ostrich and kangaroo (well, you know what those are). It's your chance to taste Walka Pulka Dukha Kangaroo. Chef Athol Wark, former chef at Alice Springs Convention Centre and Marriott Surfers Paradise Resort on the Gold Coast, will be the man in the kitchen. 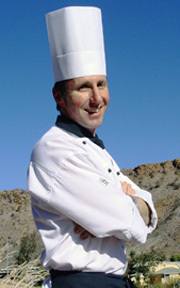 He is known for his creative way with Australian ingredients and indigenous spices. Chef Athol Wark will host a series of events featuring Australian imports this week. Taste of Australia: Village Steak & Seafood Restaurant at the Hilton Hawaiian Village offers a special menu of Australian dishes. Dishes include Lamb Prosciutto, Roasted Barramundi, Mountain Pepper Berry Kangaroo and Wattleseed-Spiced Panna Cotta. A selection of Australian wines will also be available. Prices on main dishes run from $25 to $40. Seatings are 5:30 to 9:30 p.m. Call 949-4321, ext. 39. Under the Southern Cross: Chef Russell Siu collaborates with Wark for a dinner of 10 dishes, 7 p.m. next Sunday at 3660 on the Rise. Wines will be paired by importer Joe Zapata of Southern Starz. The menu includes Pan-Fried Barramundi with Wattleseed Hummus, Aniseed Myrtle Five-Spiced Smoked King Prawns, Lamb Backstrap with King Prawn Colcannon, Walka Pulka Dukha Kangaroo and Dreamtime Macadamia Nut Pavlova. A tasting featuring 20 Southern Starz wines will precede dinner at 6 p.m. Cost is $65. Call Vintage Wine Cellar, 523-WINE. Hawaii International Film Festival: Australian appetizers will be served at a reception in advance of the Australian feature "Three Dollars," 4:30 p.m. at the Hawaii Theatre. Tickets, which include the film at 6:30 p.m., are $50. Call the Australian American Chamber of Commerce, 526-2242. Master Sommelier Roberto Viernes and executive chef Aaron Fukuda host a dinner dedicated to truffles and the wines that go with them, 7 p.m. Tuesday at Sam Choy's Diamond Head. The menu for the "Wines & Truffles" dinner: Caesar Salad In Crispy Truffled Crouton Bowl (with 2002 Henri Perrusset Macon Villages), Truffled Potato Gnocchi (2002 Paolo Scavino Langhe Bianco), Misoyaki Seabass on Truffled Sushi Rice (2002 Marcel Lapierre Morgon), Truffle Dusted Duck Breast (2000 Luciano Sandrone Nebbiolo) and White & Dark Chocolate Truffles. Cost is $70. Call 732-8645.